Is there a fair and efficient way to fund and maintain the public services we want? I, _______________, pledge to the taxpayers of the ___ district of the state of ____, and to the American people that I will: ONE, oppose any and all efforts to increase the marginal income tax rates for individuals and/or businesses; and TWO, oppose any net reduction or elimination of deductions and credits, unless matched dollar for dollar by further reducing tax rates. Here’s the truth: The only way America can reduce the long-term budget deficit, maintain vital services, protect Social Security and Medicare, invest more in education and infrastructure, and not raise taxes on the working middle class is by raising taxes on the super rich. Public services must be paid for with taxes. The pledge that the Americans for Tax Reform have asked all new members of Congress to sign since 1986 exacts an absolute promise not to vote to raise taxes of any kind, including the marginal tax rate. The marginal tax rate can be used to compel wealthy people to pay a higher proportion of their income than middle income or poor people pay. Robert Reich argues, in contrast, that firm caps on taxes, especially for the wealthy who are most able to pay, have significant opportunity costs in the form of reduced government services, increased taxes on the middle and working class, or increased deficits. Some may wonder why we have deficits or debt at all if the government has nearly unlimited authority to tax residents—why don’t we just tax our way out of debt? Others wonder, given the obvious costs and loss of economic freedom, if it wouldn’t be preferable to simply eliminate most or all taxes, public goods, and services and allow people to spend money as they please. In between these two extremes, there are challenging and nuanced questions that can be examined using the tools and evidence of economics. How can we generate the revenue we need to pay for public services without disrupting the economy by reducing the ability of people to pay for goods and services? Would we accept a tax system that generates enough revenue, but encourages undesirable behavior. Is such a system sustainable? How do we decide if taxes are “fair”? Should senior citizens have to pay for schools they will never use? Should pacifists be expected to pay taxes that go to support the military? Should the wealthy be asked to pay more because they are able, or is that punishing success? This lesson explores these issues by examining the gas tax and the capital gains tax on investment income. Students will begin with the question of why we tax. Then, they will compare the cost of taxation to the costs of deficits and debt. Students will identify criteria for fairness and efficiency and use those criteria to judge the gas tax and the capital gains tax. This lesson assumes some prior knowledge about what taxes are, and familiarity with some basic types of taxes, including income, property, and sales taxes. Students should also know how regressive, proportional, and progressive taxes work. The Overview of Federal Taxes document provides this background. Additional background, beyond what is provided here, also is available in the Glossary of Common Terms for students unfamiliar with the terms used in this lesson. In a budget that includes debt service, defense, and social welfare programs as major expenditures, balancing the budget through spending cuts or tax increases alone will be judged by many to be unwise, unfair, and/or untenable. Taxation has both direct and indirect costs, directly reducing income and some freedom to spend and indirectly affecting markets and distorting incentives. The “ideal” tax system is designed to balance the goals of efficiency and equity; an individual’s ideal system will vary based on values and preferences. Ask good questions and make inferences. Ask students to discuss what they already know about taxation using Resource 1, Two Political Cartoons, as a trigger to discussing arguments favoring taxation and arguments against too much taxation. Begin by dividing the class in half and distributing Resource 1 to students. One half should receive Cartoon A and the other half Cartoon B. Instruct students to analyze the cartoons. Students who receive Cartoon A should use it to trigger the discussion “Why does society need taxes?” Students who receive Cartoon B should use it to trigger the discussion “Can taxes be harmful to the individual or to the economy?” Tell students to consider what they think the cartoonist is trying to say and how that message fits with what they already know about taxation. Students should share their cartoons, interpretations, and responses to the trigger questions with one another. The objective is not to debate these questions, but rather to clarify what they know and think. Students should try to challenge, question, and cross-check one another to come to the best possible responses to the two framing questions as a group. Online Extension: Students may use CEE's Image Annotation Tool to comment upon Cartoon A (by Khalil Bendib, distributed by OtherWords.org ) or Cartoon B. Encourage students to add a caption, thought and/or speech bubbles, and clip art stickers to reinforce the meaning of the cartoon. As an added challenge, have students use these tools to alter the meaning of the cartoon, presenting a perspective that differs from that of the cartoonist. 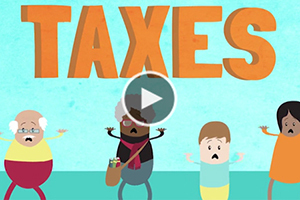 Online Extension: Use our Overview of Federal Taxes animated video as a bell ringer to initiate a classroom discussion on where federal revenue comes from and how is it used to pay for the services we rely on. You may also wish to distribute the Overview of Federal Taxes handout. Inform students that they will now need to make decisions as voters on the design of the tax system. They will likely wish to support changes to the tax code that maximize benefits and revenue and minimize costs. To create a framework for making such judgments, students will engage in a simulation based on an idealized scenario in which they will select and prioritize criteria for evaluating the benefits and costs of any given tax. They will then “test-drive” and adjust their criteria based on two concrete examples. Distribute Resource 2, which describes the idealized scenario and offers suggested criteria from which students may select. Students should read the scenario, add any criteria of their own to the suggestions, and rank what they consider to be the top five most important criteria. Students should then reassemble in groups of four and compare responses, coming to consensus on the three most important criteria. Each group must also provide justification for the criteria it selects. Once the groups have finalized their criteria, transition to the next activity by leading a discussion on which criteria relate to “fairness,” which relate to “efficiency,” and how students define those terms. The groups of four should now split into pairs. To prevent bias for or against each tax carried over from the cartoon activity, each pair should include one student who had Cartoon A and one student who had Cartoon B. Within each group, one pair will receive Resource 3 and examine perspectives and evidence on the user tax on gasoline, and one pair will receive Resource 4 and examine the capital gains tax. For the remainder of the period and for homework, students should individually read through all of the cartoons, text excerpts, quotations, tables, and graphs contained within the resources. As they read, they should highlight or note whenever there is evidence related to one of their top three criteria selected in the previous activity, and whether that evidence gives information on the fairness of the tax, the efficiency of the tax, or both. What is the justification for the gas tax? Why are some people opposed to the gas tax? How does the gas tax in the United States compare to gas taxes in other countries? What does it mean that the tax system is progressive? What is the justification for that? Why is the capital gains tax an exception to how progressive the tax system is? What is the reason for the exception? Distribute Resource 5, which asks students to reassess their initial criteria. Groups should consider whether the priorities selected on day 1 have changed, and discuss why. Then, they should fill in the criteria, whether or not they have been revised. For each criterion and each tax, students should consider what questions they have and what additional economic evidence they would seek for better assessment. Inform students that this will serve as their final recommendation to Congress. Inform students that the current gas tax is 18.4 cents a gallon, and the current maximum capital gains tax is 15%. Without discussion, ask students to write on a piece of paper what their “gut feeling” on these taxes is—should they be raised, lowered, or kept about the same? In order to preserve the independence of their judgments, ask students to hide their answers, perhaps by folding their paper. Poll student responses and then ask for volunteers to defend their answers. Ask students who have not responded what more they would want to know to fully support their opinions. For homework, students should draft a letter to the Congressional Ways and Means committee summarizing their recommendations for how to further study these two important taxes. Tell students to account for the best of their classmates’ reasoning in making their recommendations. CCSS.ELA-Literacy.RH.9-10.7. Integrate quantitative or technical analysis (e.g., charts, research data) with qualitative analysis in print or digital text. CCSS.ELA-Literacy.RH.11-12.8. Evaluate an author’s premises, claims, and evidence by corroborating or challenging them with other information. D2.Eco.6.9-12. Generate possible explanations for a government role in markets when market inefficiencies exist. D2.Eco.8.9-12. Describe the possible consequences, both intended and unintended, of government policies to improve market outcomes. Forbes, S., & Ames, E. (2009). How capitalism will save us. New York: Crown. Explore other types of taxation (carbon taxes, consumption vs. income tax, flat tax proposals, etc.). This can include critically evaluating tax reform proposals by 2016 presidential candidates. If this lesson is used as part of a unit on the price elasticity of supply and demand, students can be encouraged to seek evidence on how production and consumption of gasoline vary by state and how they have changed over time as states have raised and lowered their gas taxes. This can help illustrate how elasticity determines the incidence of a tax. Students can be encouraged to draw graphs predicting what would happen if an excise tax, such as the gasoline tax, were raised or lowered, labeling supply curve, demand curve, producer surplus, consumer surplus, tax revenue, and deadweight loss. Students with some background in macroeconomics can be encouraged to think about taxation as a tool of fiscal policy. In particular, they should compare the effects of cutting taxes to those of increasing government spending, consider the tax and spending multipliers, and use this analysis to further explore the effects of capital gains taxes on investments and long-run growth.